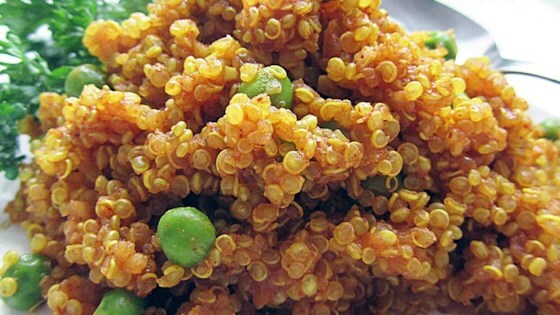 "A light curry flavor makes delicious quinoa a great side dish for a multitude of main courses." Heat oil in a large skillet over medium heat. Add onion and garlic and cook and stir for 2 minutes; add quinoa and cook and stir until lightly toasted, about 5 minutes. Pour broth into the pan and bring to a boil. Reduce heat and add curry and chile powders; cover and simmer until tender, about 25 minutes. Season to taste with salt and pepper. This curried quinoa uses ingredients commonly found in the pantry. Oh my goodness, does this taste wonderful! I turned it into a main course, adding grilled chicken, zucchini, yellow squash and fresh peppers. Fantastic! This is so good! I did change it up a bit by adding 1/4 tsp of cinnamon and a can of chickpeas. I also threw in some craisins. Loved it! Thanks! Hubby said it was a 5. Since we've been exposed to several Quinoa recipes, we really like it. I will reduce the ancho chile powder to 2 tsp next time because I felt it overpowered the curry.